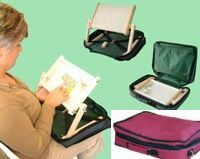 Stitch hands free anywhere with this frame and stand in a canvas carry case. The fold-back cushioned top of the case provides a comfortable and stable padded base when the frame is in use. A handy pocket holds charts and accessories. 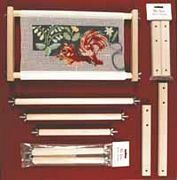 The frame has Clip-n-Sew rollers meaning this can be set up and taken down quickly. This item comes with a 15 inch frame and a burgundy coloured case. 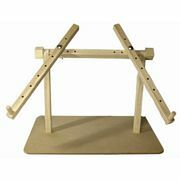 Due to the size of this item there is a £5 courier charge included in the price, overseas postage will be charged at cost. Order in the next 42 minutes and it will be despatched today.